Available in 8.4- and 10.5-inch sizes, it comes armed with the best possible specs, including a stunning 2,560 x 1,600 Super AMOLED screen, 12-hour battery life and a slim build that measures just 6.6mm thick. All of these features definitely bring you an extraordinary movie watching experience. However, the same as other Android tablets, the Galaxy Tab S can't play DVD movies directly. To get the work done, you need to convert DVD to Galaxy Tab S compatible video formats first and then transfer the converted video files to your tablet. It's easy to do with a professional DVD to Samsung Galaxy converter. EaseFab DVD rip software is a dynamic DVD ripping tool that can help you rip DVD to Galaxy Tab S highly supported MP4 video files with high output video quality and fast ripping speed. Besides, this DVD converter can also help you convert DVD to all other popular video formats like AVI, MOV, MKV, WMV, FLV, MPG, etc. for playing and sharing on iPhone, iPad, Archos, Zen, Blackberry, YouTube, Facebook, etc. bypassing the DVD copy protection. Just get it now and follow the steps below to copy DVD movies to Galaxy Tab S 10.5/8.4 for smoothly playing! Next, select a proper output video format. 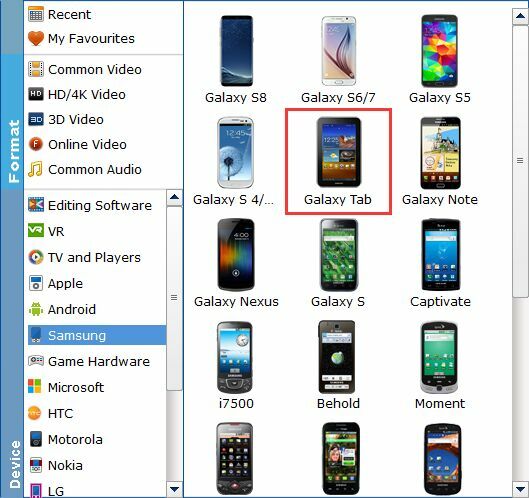 this DVD converter provides the video profile for Galaxy Tab S so you don't need to be bothered by what format to set as the output file format. By choosing Galaxy Tab, you'll convert your DVD movies to videos with optimized settings to fit Galaxy Tab S 10.5 or 8.4. When you have finished all the above settings, you can simply click the Convert button on the main interface and let the software do the DVD to Galaxy Tab S conversion for you. After the conversion, click "Open" to locate the converted video files and then transfer them to your Galaxy Tab S 10.5 or 8.4 for watching on the go with ease.